Robert Darnton, Carl H. Pforzheimer University Professor and University Librarian, Emeritus, Harvard University will be speaking at the Central Library on February 7th. Professor Darnton is a Rhodes Scholar, MacArthur Fellow, and National Humanities Award Recipient recognized for his outstanding achievement as a cultural historian. 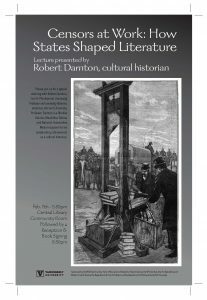 He is an author who specializes in 18-century France and a pioneer in the field of the history of the book. The event is sponsored by the Wild Bunch Lecture Fund of the Jean and Alexander Heard Libraries, the W.T. Bandy Center for Baudelaire and Modern French Studies, the Department of French & Italian, and the Department of History at Vanderbilt University.